Program arranged by NEHA Vice President Libby Bischof. Registration is REQUIRED for all conference participants, including panelists, panel chairs and commentators. Pre-registration is strongly recommended. Although same-day registration at the conference is possible, luncheon seating may be limited. Please do not mail the form after April 5th, as it may not be received on time. Walk-in registration (cash or check only) will be available on the day of the conference beginning at 8:00 am. Instructions for Panelists: please remember to send your papers and a brief bio to your commentators as early as possible so they might have time to review them with care. Panels are 90 minutes in duration. Chairs should introduce the panelists and their papers. Each paper presentation should last no more than twenty minutes. If there is a panel commentator, she or he should speak for no more than ten minutes to leave time for a general discussion involving the audience. All session rooms will be equipped with internet-connected computer workstation and projector. If you will need additional equipment, please notify in advance the program chair, Libby Bischof. Conference Schedule: Saturday, April 13: Continental breakfast at 8:00 am in the Student Union. Two morning sessions (8:30 and 10:30) and one afternoon session (1:45). Members are invited to bring copies of their own recent publications as well as timely professional literature for display or distribution in the book exhibit at 10:00 am on Saturday. Luncheon will be served but seating is limited, so please reserve your space at lunch when you register. A complementary continental breakfast and a ticketed luncheon will be served on Saturday; please reserve luncheon in advance since this facilitates meal planning. Indicate any dietary needs when you register. We cannot accommodate special dietary requests on the day of the conference. 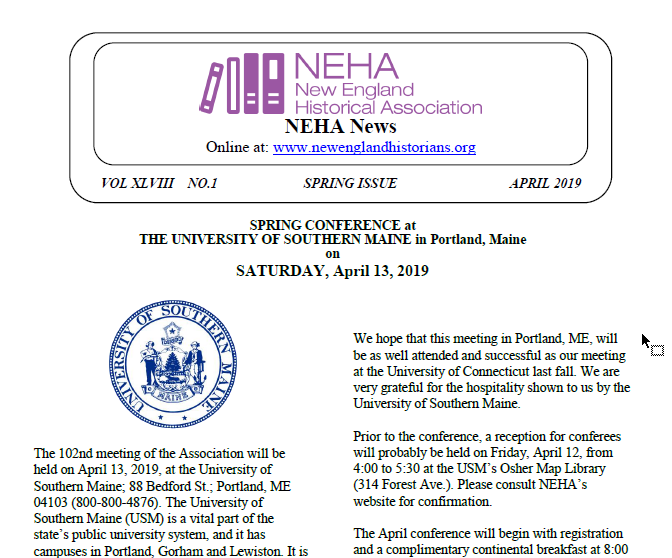 We look forward to seeing you in Portland in April!